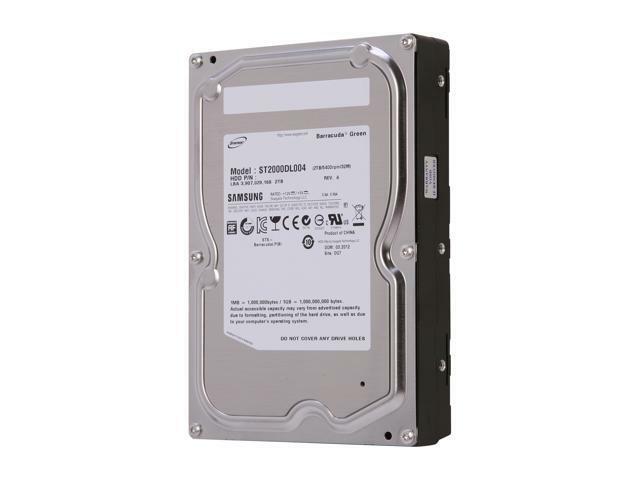 Samsung has long been an industry leader in the development of hard drive technology. This hard drive is a high quality work horse with RoHS compliance that will help you easily plow through all your most demanding computing needs while keeping environment friendly. Featuring SATA 3Gbps interface. generous high speed cache and large capacity, this hard drive delivers unbeatable performance required for data-intensive application. An array of innovative design such as TuMR/PMR head with FOD technology, Load/Unload Head Technology, SilentSeek and NoiseGuard works underground to provide the best reliability, optimized power efficiency and reduced noise for impressive performance and experience. Best of all, its dual-ARM based firmware radically improves the data transfer rate for quick response and minimized system slowdown. Purchase this hard drive today and finally taste the capacity, speed, and dependability you so much crave from your computer. Get yourself a taste of the good life at a good price! High Performance Combining SATA 3Gbps with Native Command Queuing, generous high speed cache and large capacity, the Samsung Spinpoint F4 drive delivers solid performance to meet the most demanding applications. Optimized Acoustics Featuring advanced SilentSeek technology and NoiseGuard in combination with ATA Automatic Acoustic Management Feature, the Samsung Spinpoint F4 drive helps create an almost silent work space and keep your mind in peace. Full-Featured Hard Drive An array of advanced technology such as dual-ARM based firmware for improved performance, Advanced dynamic FOD control for best data integrity, PMR technology with improved recording stability over temperature, intelligent compensation of external disturbance, shock & rotational vibration sensor for stable operation and Device Initiated SATA Power Management makes this hard drive a perfect choice for your high end computer system. This product is end-of-sale and no longer warranted by the manufacturer. Instead, Newegg warranties this product for one year from date of purchase. If you require warranty service after thirty days, please contact Newegg Customer Service, not the manufacturer. Pros: The year is 2019, I bought this back in 2011. I am STILL using it. Need I say more? Pros: Silent, reliable and fast (for 5.4K RPM). Came well packed, and works 24-7 non-stop (for a month now) in my home server without any problems. Price is pretty good for a 2TB drive too. Other Thoughts: Edit: Update after 8 years later, the hard drive still works perfectly after 36,563 hours of on time (more than 4 years or total on time) and after powered on 2,731 times. I first wrote this review 2011, Its now 2017 and this drive is still going! Cons: firmware update process - poorly addressed and executed. cannot tell if a drive was patched or not. Other Thoughts: speed on par with my WD EARS. Other Thoughts: Had to update firmware right after purchasing which shows that the manufacturer cared enough to release updates. I have used the drive in my WHS v1 server 24/7 for almost 5 years and then moved it to a small D-Link DNS320L device for backup purposes. Pros: Installed four drives in Synology DS410 NAS box in November 2010 and they have been running 24/7 ever since. So far, no problems and no worries. They are quiet and dependable. Always pass the weekly disk checks. Cons: A bit slow (5400 rpm), so am replacing with 7500 speed drives. Other Thoughts: Would keep these going but they are 75% full so it is time for an upgrade to 6TB replacements. I hope the next drives are equally quiet and worry-free, but quicker. These have been nice drives.